For finishing internal angles this trowel is a flexible one piece stainless steel blade set at the correct angle to create a perfect 90° corner. For finishing internal angles this trowel is a flexible one piece stainless steel blade set at the correct angle to create a perfect 90° corner. Fitted with a full size soft grip handle for user comfort. 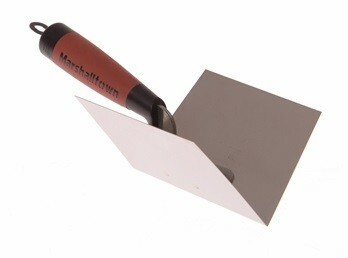 Inside and outside corner trowels available.